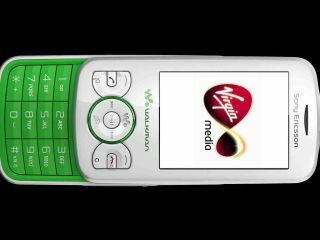 Virgin Media has announced that it is now offering the Sony Ericsson Spiro, and has the exclusive on the 'Spring Green' coloured version of the phone. The Walkman branded phone is offered on PAYG, and will cost £49.99 when bought with £10 of airtime. Customers trading in an old mobile phone can also take advantage of Virgin Media's £100 airtime offer. The Spiro brings a fairly low grade set of specs including a 2MP camera, pre-installed Facebook and Twitter apps and an FM radio. The phone has a 2GB SD card thrown in – and can take cards up to 16GB. Of course, for many people Spring Green is very close to the wild cabbage that Hugh Fearnley-Whittingstall gets over-excited about, although technically speaking, fact fans, it's precisely halfway between cyan and green, we're told. So if you like green and white phones and are in the market for a sub £50 PAYG option then this is now available from Virgin Media.